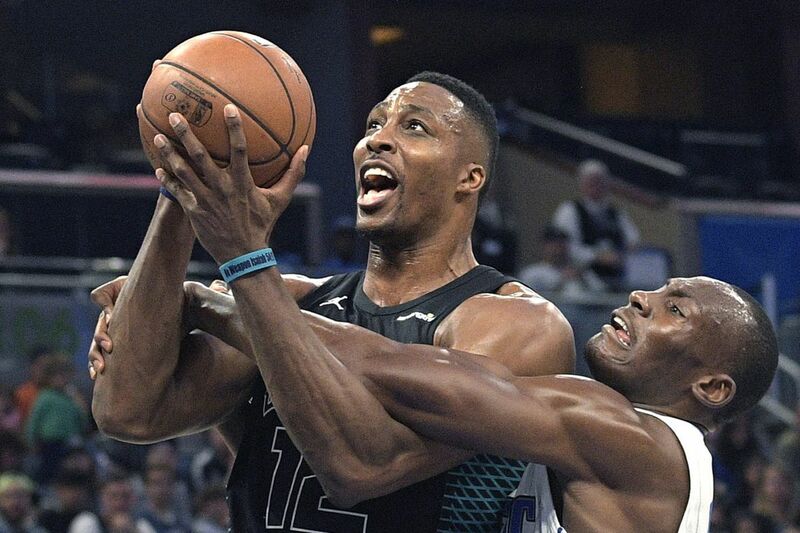 Charlotte center Dwight Howard (12), getting fouled by Orlando center Bismack Biyombo, and his Hornets teammates are 28-34. On paper, this looks like an easy one for a Sixers squad coming off Thursday night's huge road victory over the Cleveland Cavaliers. But don't let the Hornets' losing record fool you. Before Wednesday's lopsided loss to the Boston Celtics, Charlotte had won five straight games. The Hornets also boast an all-star in point guard Kemba Walker and have an athletic team. The Sixers can't afford to take them lightly in their quest to win their 13th straight game at the Wells Fargo Center. 2 Marvin Williams PF 6-9 9.5 ppg. 4.8 apg. 12 Dwight Howard C 6-11 15.9 ppg. 12.4 rpg. 5 Nicolas Batum SG 6-8 11.8 ppg. 5.2 apg. 15 Kemba Walker PG 6-1 23.1 ppg. 5.8 rpg. Injury report: Kidd-Gilchrist (left-hamstring soreness, questionable); Cody Zeller (left-knee soreness, questionable). 9 Dario Saric PF 6-10 14.7 ppg. 7.0 rpg. 21 Joel Embiid C 7-2 23.8 ppg. 11.2 rpg. 17 JJ Redick SG 6-4 16.7 ppg. 3.2 apg. 25 Ben Simmons PG 6-10 16.6 ppg. 7.4 apg. The Hornets hold a 58-42 series advantage. Sunday: 8 p.m., at BMO Harris Bradley Center, Sixers vs. Milwaukee Bucks.